Boy, my English sure are good tonight! My brain is usually going through 3 re-writes composing a sentence before my hands have time to finish typing. I always proofread, but with little avail, as I end up editing silly and sometimes important mistakes in half my posts. Early onset senility is a b*[#@$%!!!]. 1. When I saw the signature I immediately read it as McWilliams as you did Adam because the name is familiar but reading carefully, this can hardly be read as McWilliams because there is no final s and there is no shadow of the c of Mc. I'll bet you it's Al McWilliams. The scan was too rough for me to look at so I pulled out a book I've posted earlier from the GA that is signed by Al. Let me see if I can explain the signature and then take a look at your comic again to see if I'm making sense. He writes "A.M" , but the M looks like an "N" with a tiny, unconnected, half-size right line to form the "M". Then he puts a tiny "c" above the "W" (he actually breaks the left line of the W to fit the c in). The "s" at the end is extra long - stylized. Just now caught up with this thread. 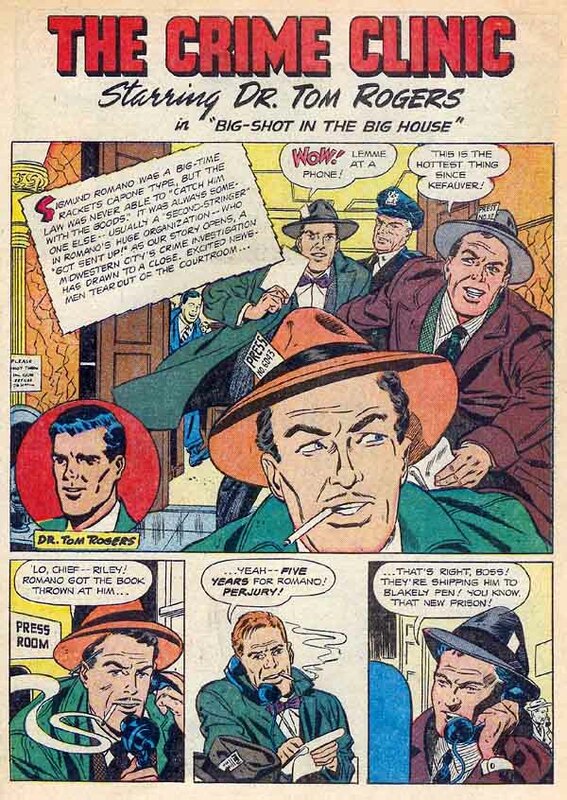 A couple of observations - I can't say that the Two-Gun Lil strip looks like Pete Morisi to me - some of the anatomy is too awkward to be his work, and Morisi usually drew women with a lipstick pout. As for the Darpis/Karpis connection look no further than the text box in the splash panel - he is accidently referred to as "Karpis" there. From my experience, the "true" stories in crime comics ranged from abreviated and sometimes sloppily researched histories of real people, to versions of the same with the names changed, to completely fabricated tales of non-existent criminals. The only reason I can think of for the name changes were that editors felt that some names may have been overused. You know some days I feel like Crime that I Can't Win. Here we have an Atlas book with 3 signed stories out of 4 and two of the artists are complete unknown (or at least, no one bothered to post any information on Dan nor Paul online). Yet, this will not deter me to milk this book for what it's worth on this thread. After all, this is another one that reeks Atom Age / Dark Age / 50s Age / Crime Wave whatever we can't agree to call it. Yes, notice the usual Quality of Production whereby the cover blurb tells us to look in for the M ue ller Gang story when, in fact, we are treated inside to the M eu ller Gang story. But more relevant to the general collecting public, you are looking at a Gerber No Show despite its SI rating of 4. I guess Ernie could find anyone with a copy of this book laden with stories by nobodies about noone. Weird, eh? Seriously, this is reminiscent in my mind to the books that made Ian's last 10 list that include a late issue Buzzy and a late issue Leading Screen, indicating again the scarcity of some of these books (that have low demand and that therefore only few dealers will stock). "Jerry Robinson was born in New York City. At the age of seventeen, Bob Kane hired him as an art assistant on the newly created 'Batman' strip. In 1941, when Kane moved on to other features, Robinson became the major artist on the strip. But Robinson never received bylines. Together with writer Bill Finger, Jerry Robinson created 'The Joker' (which was the first and also became the greatest villain in comics) and 'Robin, the Boy Wonder' in 1940. 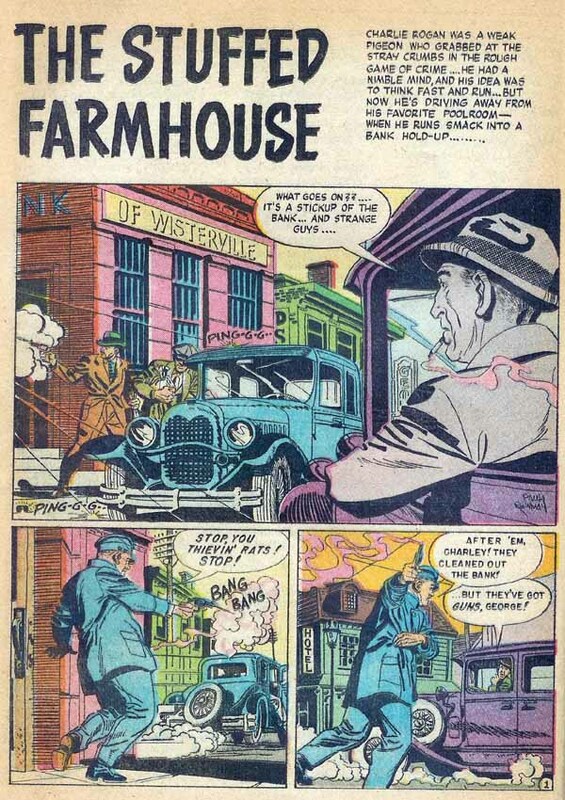 Besides working for the 'Batman' strip, Robinson did considerable work for other strips, such as 'Green Hornet' for Harvey from 1942 to 1943, 'Atoman' for Spark in 1944, 'Fighting Yank' and 'Black Terror' (together with Mort Meskin) for Nedor from 1946 to 1949. Robinson worked again with Meskin for National, drawing 'The Vigilante' and 'Johnny Quick' from 1946 to 1949. He drew 'Lassie', 'Bat Masterson', Rocky and Bullwinkle', and 'Nancy Parker' for Western from 1957 to 1963, and also wrote and drew for Timely from 1950 to 1955 and Prize from 1946 to 1949. In 1955 Robinson began working on a science-fiction newspaper strip together with Jet Scott which lasted for four years. Robinson was president of the National Cartoonist Society from 1967 to 1969. He created 'Life with Robinson' in the 1970's. This eventually led to the establishment of the Cartoonist and Writers Syndicate." Looking back over this credit list, it is far more impressive than generally thought of because most every one is quick to point out the Joker relation but he worked on a true Who's Who of comic character: Batman, Green Hornet, Black Terror & Fighting Yank, Vigilante, Lassie, Rocky and Bullwinkle, ... Impressive. Loprino's splash - The AtlasTales database lists work from Dan mostly from 1951-1954 and one last spurt in 1957-1958 in the pages of Strange Tales. Cooper's splash - Paul's output as per AtlasTales (which does not claim to be comprehensive yet) is narrower, spanning late 1951 to 1952. P.S. : rjpb - you've got the best eyes of us all - Good catch in the caption. If I get the time, I'll still scan a page with Ma and post it soon. It is still interesting (to me at least) when we can trace the crime story to some element of non-fiction as per this last example. As for Morisi, I can't claim to be an expert as I am more familiar with his later output for 70's Charlton than his early work. Anyone else can shine light on this? I looked at this page before I looked at your post and thought, that's just the like the pacing and storytelling of John Stanley. Then I read your write-up and understood why. Actually, this page is a reprint of a Sunday strip (probably late '40s vintage by the look of the art) and is by Bushmiller. Stanley didn't work on Nancy until significantly later. The Bushmiller work on Fritzi and Nancy was excellent during the '30s and '40s, but deteriorated rapidly thereafter to the point where the '60s and later strips are all but unreadable. So Stanley may have learned from Bushmiller? Or am I just imagining a similarity? I thought of Karpis because I've read a seen a number items on 30s gangsters. I've occasionally made the same mistake trying to identify an artist whose signature I completely overlooked. This is still early in Morisi's career, so I wouldn't rule him out based on the one page. As I noted, there clearly is swiping going on, so we really need to see more pages to determine the predominant influence at work. Adam - Re: "I'll bet you it's Al McWilliams. The scan was too rough for me to look at so I pulled out a book I've posted earlier from the GA that is signed by Al. Let me see if I can explain the signature and then take a look at your comic again to see if I'm making sense. He writes "A.M" , but the M looks like an "N" with a tiny, unconnected, half-size right line to form the "M". Then he puts a tiny "c" above the "W" (he actually breaks the left line of the W to fit the c in). The "s" at the end is extra long - stylized." Yes that's him. Now I know how to read the signature with the tiny c. Thanks Adam. It's too bad I didn't cover him in that feature then because you're right, that would have made for a long entry. Checking on the GCD, his other credits around that time are FC 378 and FC 400: two Space Cadet issues, both of which are right out of the range I set for the collection (379 to 386). Of course, as per this non-recorded appearance in Crime and Punishment, he might still show up again. I continue to vote for Morisi -- very strong similarity to Tuska, Morisi's primary influence. No question that the artist took shortcuts -- you see the exact same female head in the UR panel on both pages. I paged up and down a couple times because of the deja vu feeling. A rip off of Alvin Karpis? I've read a thing or two make me doubt the accuracy of many of these "true" crime stories. Do you know anyone that's tried to look these up? Anyone? I've had the same experience. Sometimes they appear real but you'd think there would be easily findable records online and there aren't. Like you, I have my doubts about a lot of them. I spent some time in January Googling a few "true criminals" with no success. Or maybe the title should have Crime Cases! as there appears to be an incessant use of exclamation points in this issue. We see Tony DiPreta again today but we will overlook him once more (very shortly as he will come back in a few days) in favor of Jack Keller (who will reappear at the same time as DiPetra and more and has already appeared in All True Crime Cases). Note though that Keller is showing up in Atlas books only while DiPetra appeared also in Lev Gleason meaning Tony had to beat the pavement a little harder to manage his accounts. The comic book world lost one of its most durable mainstays of the 1950's and 1960's when Atlas/Marvel and Charlton artist Jack Keller passed away on January 2, 2003 at the age of 80 after a short illness. Keller had a long and distinguished career spanning the years 1941-1973 on a score of features for numerous comic book companies but is best known for long runs on two features in particular, KID COLT OUTLAW at Atlas/Marvel and the entire genre of hot rod and racing cars titles at Charlton. Jack Keller was born on June 16, 1922 in Reading, Pa. Except for a short period early in his career, he would spend his entire life there. Like almost every artist from his generation, his earliest artistic idols were Milton Caniff, Alex Raymond and Hal Foster, and as a child devoured their newspaper features, especially Caniff's TERRY AND THE PIRATES. Jack Keller's last two major accounts in his comic book career would be where he'd leave his lasting mark. In 1950 Keller showed up at Stan Lee's Timely Comics doorstep and would begin an association that would last the entire decade. At this point in Timely history, Martin Goodman had just dissolved the long-standing Timely bullpen. Originating in 1941, this was a means for Goodman to save money by weening away his dependence upon the Lloyd Jacquet shop, Funnies Inc. for artwork. Goodman started an "in-house" staff to churn out the scores and scores of features appearing in his comic book line's myriad titles. Known as the "cataclysmic closet catastrophy" (as coined by Stan Lee in his recent "bio-autography"), the story goes that Goodman opened a closet to find a six foot stack of bought but never printed artwork. Going ballistic, he instructed Stan Lee to fire the staff and everyone went freelance. Jack Keller shows up right at this moment and is immediately given work with stories for Western titles, early pre-code horror and even the rare romance story. His most prolific "early" Marvel work though, was in the dizzying array of redundant Timely crime titles . This work is severely overlooked and under-appreciated when one is considering Keller's career. 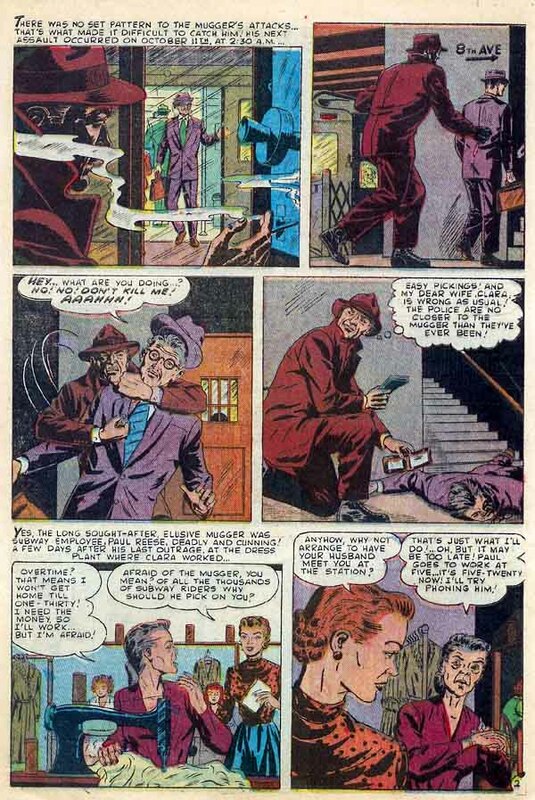 Never a spectacular or flashy artist, Keller's crime stories nevertheless had an urban grittiness perfectly suited to the subject matter with a style similar to that of crime comic collegue Vern Henkel, and two steps above the Timely crime comic bullpen fare of 1948-49. At least 75% of Keller's crime stories were scripted by Carl Wessler, who wrote more crime stories than any other Timely scribe during this period. 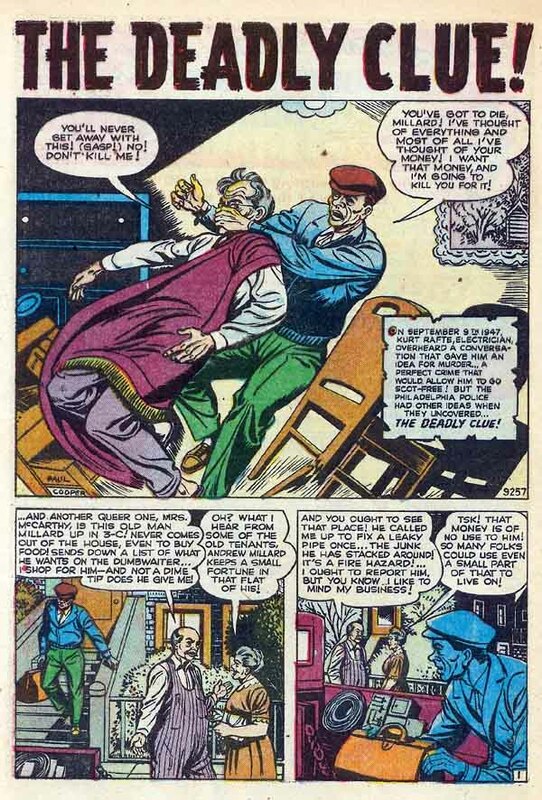 Often entire issues in 1950-51 were Wessler scripted. Look for these stories in titles like AMAZING DETECTIVE CASES, KENT BLAKE, ALL-TRUE CRIME, JUSTICE COMICS, CRIME EXPOSED, CRIME CAN'T WIN and CRIME MUST LOSE. As 1953 rolled in, Keller added more horror and war stories to his credit but a Western feature that he'd drawn since 1951, KID COLT OUTLAW, began to take prominence. 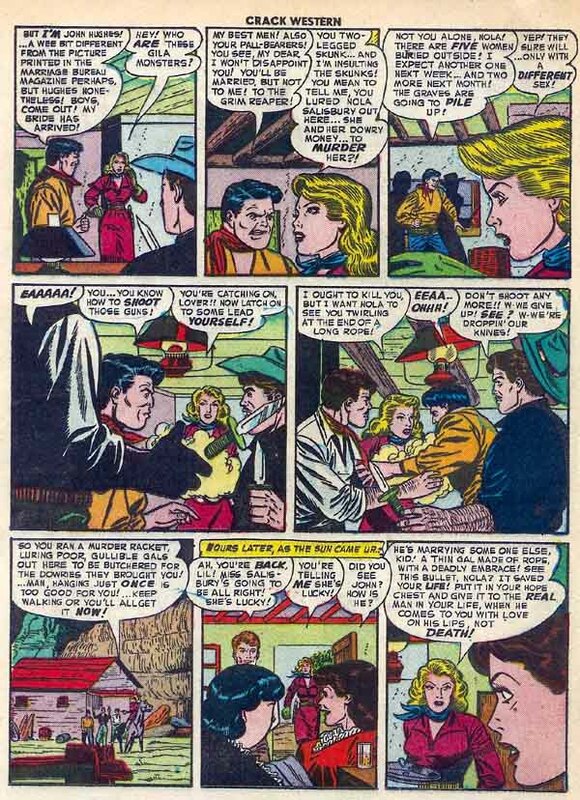 When Stan Lee gave Keller KID COLT in 1951 it was nothing more than another assignment but while other artists came and went on various features (Maneely on BLACK RIDER, WYATT EARP, RINGO KID, WHIP WILSON , THE GUNHAWK, Shores on TWO GUN KID, Romita on WESTERN KID, Roth on APACHE KID, Wildey on OUTLAW KID, etc. ), Keller "never" really left KID COLT and drew his adventures both in his own long running title and also in the anthology Western title GUNSMOKE WESTERN, right up to the Atlas implosion in the spring of 1957. Throughout this long run he would continue to do Western fillers but his non-Western work practically vanished by 1955 as his entire output was dedicated to the Western genre. In the spring of 1957 the infamous Atlas Implosion left Keller and scores of artists without their main source of freelance income. Goodman and Lee pared down the bloated line from a high of about 70 titles to a paltry 16, quickly acquiring distribution for the books from National's distributor, Independent News and Stan Lee began to use backlogged inventory for the remaining 8 books allowed per month. Keller, always a tremendous car buff, frantically secured employment at a car dealership in his home of Reading, Pa but almost immediately the Western inventory ran out and Stan called back his Western mainstay artists, Joe Maneely, Jack Keller and Ayers. Keller would return to KID COLT, but time constraints limited his work to a degree. Lee would call back additional Western artists to help out, especially with the tragic death in 1958 of his star artist Joe Maneely, and slack in the Western books was picked up by artists like Jack Davis and John Severin. Within a short time Keller also secured Western and war scripts from Charlton in titles like BILLY THE KID, CHEYENNE KID, BATTLEFIELD ACTION, FIGHTIN' MARINES, FIGHTIN' AIR FORCE, FIGHTIN' ARMY, SUBMARINE ATTACK and others. A long friendship and association with editor Giordano ensued and by 1959 Keller parlayed his love of cars and racing into a long writer/artist tenure on the title HOT RODS AND RACING CARS which lasted, with a short hiatus, until 1973. Keller would also add other hot rod titles over the years like HOT ROD RACERS, DRAG 'N' WHEELS and WORLD OF WHEELS. By 1967 Keller had finally left Stan Lee and Marvel for good and would work nearly exclusively for Charlton until 1973. A handful of concurrent stories from DC in the years 1968-71, including fillers for their HOT WHEELS title, would cap his career and Keller retired from comics and went back to selling cars and indulging his hobby of model cars and die cast car models." Please don't hesitate to navigate to Doc V.'s article as it is illustrated and includes a personal reminiscence by Doc V.
I decided to bold one comment in the article and in a few days you'll start to understand why; because we are a long way from being done with the Crime titles and those are only the ones whose titles start with the word Crime! And Goodman was certainly one who put out many of these. Or I should have said you will. Norman Saunders' son is running a website dedicated to the life and career of his father at NormanSaunders.com. I recommend you check out the Biography. Remember though that this is a labor of love as exemplified by this excerpt concerning Norm's work in comics so don't be too critical. "At that same time Norm's old publishers also sent him many jobs painting covers for comicbooks. Comics were still evolving in these early years and they often had full color covers painted by pulp artists, and their stories were filled with the same shocking pulp fiction thrills. However, these products were being distributed along with innocent kiddie comics and this shared marketing raised many censorial eyebrows! The fact that Dad's covers looked realistic, made their horror all the more gruesome. Letters of parental complaint led to a public campaign for the government to regulate "the trash we expose our children to!" This is a whipping-horse that still appeals to today's political opportunists. My father's painted covers were so nightmarish that the United States Congress actually passed a Comic Book Code of Decency Act to protect American youth from his kinds of images. How many kids can say that! The legislation was swept along with the general drive to crack down on "unAmerican activities" and by 1954 my Dad's controversial style of work was black-listed from the comics." More relevant for this thread is this link to Saunders Comic Cover Gallery, especially early 1952. I'll let you peruse at your leisure. There is a great in-house ad in the comic. It however sadly reflects on the quick demise of the comic department of Ziff-Davis. Most of the titles listed below had a very brief life, folding generally after less than 5 issues. Weird Thrillers - Spine-tingling Tales of the bizarre and unusual. 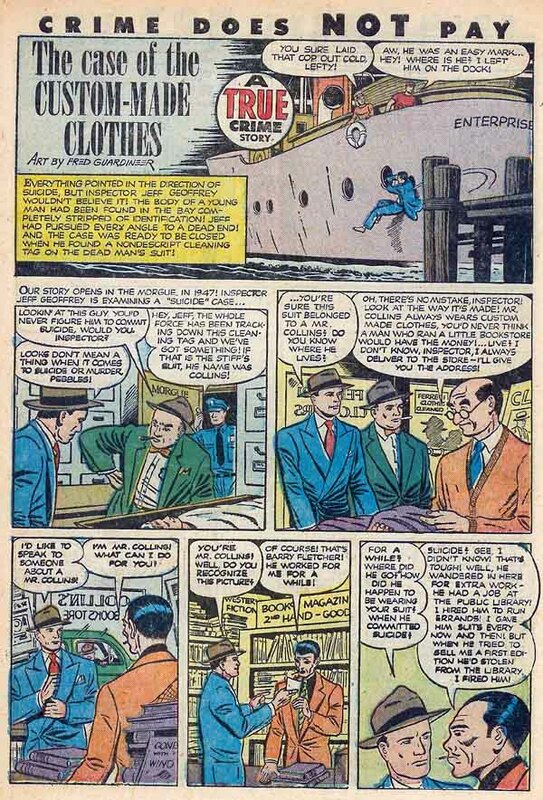 Am I hitting the heyday of the period during which Joe Siegel edited the Ziff-Davis line and tried to expand it into a full-fledged comics outfit? Is this why we get "bizarre" concept like Dr. Tom Rogers, Sparkie, FlyBoy, ... ? I don't have time to check but I trust some will enlighten / correct me. You guys have to carry your weight (Seriously work will be busy tomorrow). Notice the huge irony of the mention in the caption that "This is the hottest thing since Kefauver." Little did they know! This is the same Siegel that thought Funnyman was the next big thing. Thanks again for all the hard work on the last 2 posts. Are you moonlighting off the boards? Webmaster, is Scrooge allowed to do that? Say that's funny because I was thinking of contacting whoever's your boss (if you aren't your own) and ask him to let you off work 2 hours earlier than anyone else so you get online the same time I do in the p.m. It would save me time by just asking you questions instead of looking things up in my books or online. I ordered the Murphy Anderson book by R.C. Harvey almost a month ago but still hasn't showed up I think it's time for an email to the vendor. I go to the gym after work. I have the Anderson book, but there's a large stack I haven't gotten too. He's been extensively interviewed over the years so I wasn't expecting much new stuff for me in the book. My favorite artist appreciation book is Sadowski's Krigstein. For me, it's hand's down the best book produced about a comic artist. It doesn't hurt that I'm Krigstein fan, but I think the book is well written, beautifully illustrated, and impeccably designed.. Yes I agree with you about the quality of Sadowski's book; even though in a sense Krigstein does not contribute much to the field (considering his limited output) and lack of consistency in that output (his story King of the Con Men in All True Crime Cases 49 which I profiled what seems a long time ago is clearly sub-par but this was work for Atlas crime, not what he is best remembered by). My main gripe about the book (and I need to relax as it seems I am getting more and more critical here) was that I wish it would have included a better bibliography of Krigstein's comic work. I have volume 2 also but haven't had the chance to read those stories. You know thinking back over it, we've been lucky lately with the quality of books coming out. By the way, if I remember correctly, a local used book store has a copy of volume 1 either half-price or discounted anyway so if anyone is interested, let me know. Let me do a poor job on all three then. According to the Comiclopedia, "Bill Ely drew several adventure comics throughout the 1940s and 1950s. For Dell/Western Publishing, he illustrated among others 'Ellery Queen', 'Zorro' and 'Ripley's Believe It or Not'. He has also drawn adventure comcis for DC/National, Centaur, Fiction House, ACG/Creston, Ziff-Davis, Eastern Color, Hillman, Marvel and Charlton from the late 1930s to the 1960s. He has done such superhero comics as 'Rip Hunter, Time Master' and 'The Atom'." A little sketchy on details but could not find better elsewhere, except this discussion online but not knowing the credentials of the author, let's take them with a grain of salt: "Several of [his] stories were reprinted in various DC giants during the seventies and I always thought they looked out of place. Not bad but more illustrative in a way than what I was used to. I guess he really was probably drawing in more of an Alex Raymond influenced style than anything, but there was something kind of squinty and maybe a little watery about his line that kind of stuck in my mind. I said it reminded me a little of Dan Spiegel but it's not really that close of a resemblance. I have seen Gerry Taloac (sp?) use a similiar line at times." Paul Reinman was recently profiled in AE 42 and his Comiclopedia entry (which I link because the panel used for illustration is from today's book) reads "Paul Reinman was an artist of the American Golden Age. He continued 'The Atom' from 1947 to 1949, succeeding the series's creator Ben Flinton and Jon Kozlak. He has done such titles as 'Green Lantern', 'Starman', 'Wonder Woman' and 'Thunder Agents'. His stories also appeared in Crime Detective Comics and Fear. From 1949 to 1950, he did four stories of the daily 'Tarzan' strip. His most notable work appeared in the Atlas war books from 1952 to 1953. For the same publisher, he did religious comics, such as 'The Temptation of Jesus' and 'The Fall of Jericho'. He was Jack Kirby's inker in the 1960s. In 1965, he graphically created 'The Mighty Crusaders' for Archie Comics." Richard "" Briefer went to New York's Art Students League and entered the comic book business in 1936 as a member of the 'Jerry' Iger studio. Briefer's earliest work appearred in 1936 in Helne's 'Wow', one of the first comic books to carry original material. Over the next years at the Iger studio, Briefer produced material and titles like 'Hunchback of the Notre Dame' and Flint Baker' from 1938 to 1941 for Fiction House, 'Rex Dexter of Mars' from 1939 to 1941 for Fox and 'Human Top' in 1940 for Marvel. In 1940 however, Briefer approached the Prize group with the idea to adapt Mary Shelley's 1818 'Frankenstein' to comics. After six years running, the 'Frankenstein' series ended in February 1949, and returned to serious drawing. In March 1954 the Prize group recalled him to revive 'Frankenstein', but the revival ended in November 1954. Briefer left the comic industry shortly thereafter to concentrate on advertising artwork. He died in the spring of 1982." For an extensive look at Briefer's work on Frankenstein, check out last year's Halloween issue of AE. There are plenty of his Frankenstein stories on display online and you can find three here with a short bio and another few here, there and everywhere. Onto the splashes. One thing I liked about the book is that (intentionally or not), the artists made an attempt to reflect the time periods and locations of the stories in their art (at least for the first unknown artist and Briefer). OS Guide Pet Peeve: this book, IIRC, is listed as drug cover in the guide (which is true enough) but of course there are no drug stories inside. This is only my second most annoying peeve in the guide. The first one is all the books where Frazetta is mentioned as having work, even if it is only a one-page ad and for which the prices are higher than surrounding issues. Drives me nuts. even though in a sense Krigstein does not contribute much to the field (considering his limited output) and lack of consistency in that output. You could say the same thing about Orson Welles and his impact on cinema. I love Krigstein, and I was trying to tone down my enthusiasm for fear of setting expectations too high for the Sadowski book. Krigstein is artist that typically produces a binary reaction -- people tend to love him or hate him. However, I wouldn't rank the "impact" of an artist on output or consistency. Krigstein's best, epitomized by "Master Race", isn't topped, in my opinon, by any other comic story ever published. And that's not just because it's a great story or the art is outstanding, but because it's such complete use of the medium in service to that story to produce an overall effect that is trully greater than the sum of its parts. Nor is that the only story he did that included bold experiment (most of which worked). There are quite a few of these. It was only the constraints of Al Feldstein (unwilling to let him re-structure the text on his EC stories -- the only exception being Master Race) and then the need to produce quickly for little money (Atlas) that prevented him from continuing to develop. I don't want to write any more about Krigstein, as the best commentary about him has already been written by Art Spiegelman in Squa Tront 4. I highly recommend it as a complement to the Sadowski books. Scrooge: I hope I don't sound too defensive here. I realize there are quite a few folks that don't like him or are indifferent to him. Nonetheless, I think the industry is still trying absorb what he was able to do. "Bob Fujitani studied at the American School of Design in New York City. He has done comics art for a variety of publishing houses from the early 1940s. He has drawn for among others Ace/Periodical House ('Lash Lightning'), Avon (Eerie, western), Dell (adventure and historical comics), Harvey ('Green Hornet', 'Shock Gibson'), Lev Gleason ('Adventures in Wonderland', 'Crime Does Not Pay', 'Two-Gun Kid') and Quality ('Black Condor', 'Dollman'). He has done illustration work for Boys' Life and The Golden Magazine. He has worked as a ghost inker on the daily 'Flash Gordon' comic in the 1960s as well as the 1970s. In the mid 1940s, he also worked on the daily 'Judge Wright' strip. In the 1990s, he worked on the 'Rip Kirby' daily." Most of the online references point to his Dr. Solar, Man of the Atom work as it has recently been reprinted. Obviously his work for CDNP is not his best but that's what we have for today. Considering how important this title was for Crime Comics history, it deserves its own entry in the Toonopedia here but I'd rather direct you to the Crimeboss website where you should navigate to the articles from CBM that are transcribed there if you haven't read them (and instead of me pasting them here) and also to the extensive gallery. Second Story Page - Can anyone defend the reason behind the panel breakdown on the top tier? Do they serve any purposes? If they do, I miss the point and would appreciate being enlightened. P.S. : At times searching for content I come across interesting sites that are not directly connected with the books but this is something I find amazing. Check out this link to a photographic tour of Bob Hyde's ERB collection and make sure to continue through the three galleries. Simply amazing. I too love the historical setting to these stories. A nice change of pace from the usual comic fare. I suspect the first artist is Mort Lawrence. He started his career imitating ER Kinstler -- only he's not as good. I'd have to pull a few books out and look and some more pages from that story, but I'd take a small bet that it's Lawrence. The chubby dude in the second story is modeled after the actor Charles Laughton. Not that anyone cares. I don't like the art in the 3rd story by Briefer. I do think his work on Frankenstein is wonderful. Thanks, as usual, for such a fine post!